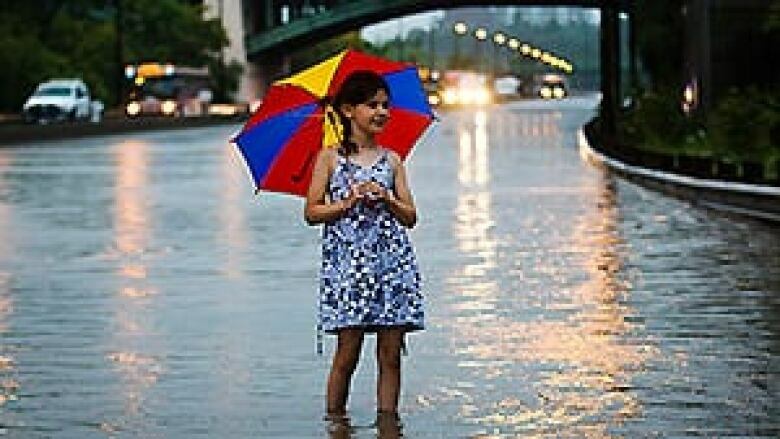 The weather across Canada so far this year may appear extreme – from unprecedented floods in Alberta to the first-ever July without rain in Vancouver – but there's no easy way to conclude what's going on with our climate, says Environment Canada senior climatologist David Phillips. Vancouver is basking in the hot and heady glow of a July with no rain – its first ever. Farmers in Windsor, Ont., have just experienced the wettest month on record and are worried about what it will mean for their crops. Take a pulse of the weather across Canada so far this year, and it’s as variable as the country’s vast and changing landscape. Sometimes, a big weather story is what didn’t happen. For example, it’s been a relatively tame forest fire season across Canada thus far. And as devastating as the Alberta flooding was, other feared floods didn’t materialize. People on the Prairies had been bracing for spring floods after record winter snowfalls. "They had a spring that was disguised more as winter and the snow was there even at the end of April," says Environment Canada’s Dave Phillips. Fears mounted and talk turned to filling sandbags because the flood of the century was on the way. "Well, it wasn’t. It just fizzled and the reason for that was because the warm weather didn’t come," says Phillips. "They were praying for warm weather, but really, nature knew what was right, and so brought them coolish weather and it slowed the melt. If it had come all at once, there would really have been problems." But even in the shadow of the unprecedented Alberta floods and the record-breaking deluge that soaked Toronto, there’s no easy way to conclude what’s going on with the climate, says Environment Canada senior climatologist David Phillips. "The question people are asking is, ‘Whatever happened to normal weather?’" he says. "And of course, that’s the problem. We do everything based on normal weather. We plan our holidays. We plant seeds. We make policy. We build hospitals and schools based on normal weather." But anecdotally and around the water cooler, the talk across the country is about how the weather seems to be anything but normal. People talk a lot about how there seem to be greater extremes, but Phillips cautions against drawing immediate conclusions or latching onto trends based on individual events or records. "I think … the broader issue is that: Are we really seeing more of this wild weather, more costly [weather]?" asks Phillips. Climatologists are also struggling with that question, he suggests. "They’ve proved the world is warmer. They now seem to be so focused on are we seeing wilder, more extreme weather and they realize that’s even a tougher nut to crack. "You can always get temperature records all over the world for centuries, but boy, deciding whether this rainstorm, which is very rare, is more of the same, [or] has the weather changed or is it cyclical, is it bad luck or are we just getting in the way of nature – that’s another issue." Still, some weather headlines stand out for Phillips so far this year, and some could have future implications, he suggests. "The foothills flooding in Alberta is clearly one. It’s a game-changer and may very well be so dramatic that it changes government policy. Often, weather doesn’t do that." Through a unique confluence of unexpected weather, heavy rain and a still partially frozen landscape, communities from Canmore to Calgary and High River were devastated by unprecedented floods in June. Premier Alison Redford has warned the provincial cleanup could last up to a decade. And then there was the Toronto storm, a three-hour deluge on July 8 that Phillips says was "probably the wettest moment" in the city’s history. Phillips has looked carefully into what occurred and doesn’t find many easy ways to explain it, other than "bad luck," which he acknowledges doesn’t sound very scientific. With 40-plus years in the weather business, Phillips says he has come to think that whatever extreme weather you pick, conditions could always have been a little bit worse: more rain could have fallen, the timing could have been different and so on. But not with the Toronto deluge. Two storms merged over the downtown on a Monday at rush hour, "in the most vulnerable, most paved, most asphalted part of the [Greater Toronto Area] and in rainfalls that only Hollywood could script," he says. As difficult as Phillips considers it is to conclude exactly what’s going on with the weather, he does have another question to ponder. Again, the answer’s not conclusive. "My sense is you can’t say that from what we’ve seen. If you just take a snapshot of this year, there’s been a lot of unfortunate things. It’s been costly, but it’s not necessarily a forecast for next year or the year after." He also offers a cautionary tale for anyone who thinks any of the answers to these questions will be developed solely by engineers devising clever ways to hold back or counteract the forces of nature. "I often think what changes more than the weather is the people. We seem to be living where we shouldn’t be living," he says. "We’ve got more wealth and we think we can engineer our way out of weather. Well, hey, nature holds all the trump cards." Some lessons have been learned from extreme weather. The devastation and death wrought by Hurricane Hazel in Toronto and the surrounding area in 1954 prompted a major rethink in flood plain management. But Phillips doesn’t think enough has been learned. "The reality is we’re experiencing new things," he says. "And so my sense is that if we look to the past, it won’t give us the guidance to the future. We have to recognize the climate is changing and that we have to do things differently and people who do things differently will come out winners." Disaster has a "human signature," he suggests. "Nature doesn’t produce disasters. It triggers events and what turns into a disaster is what we’ve done in terms of land use or building or non-building or non-protecting or what have you." After thinking more about what’s happened so far in 2013, Philips suggests there may be lessons from this year. "Maybe it’s a seminal year in which we’ve seen events that have happened – and my God, we still have half a year to go – maybe these ones will shock decision-makers into at least doing something different than the past, because what we’ve done in the past hasn’t really worked."